‘This Ball of Mud and Meanness’ is a perfectly reasonable Gotham episode. I’d go so far as to say it was even good. Thing is though, I wasn’t grabbed by it in a way that made me sit up and take notice. I’ve been thinking about this on and off today, trying to work out why I feel that way and I think it’s the promise of the title that doesn’t quite get realised. Gotham City is a bad place; we’ve seen that now on many occasions and the show has made a particular point of it in season 2, most notably with the slave auction in ‘By Fire’. “This Ball of Mud and Meanness” then, would seem to promise even more gritty nastiness. 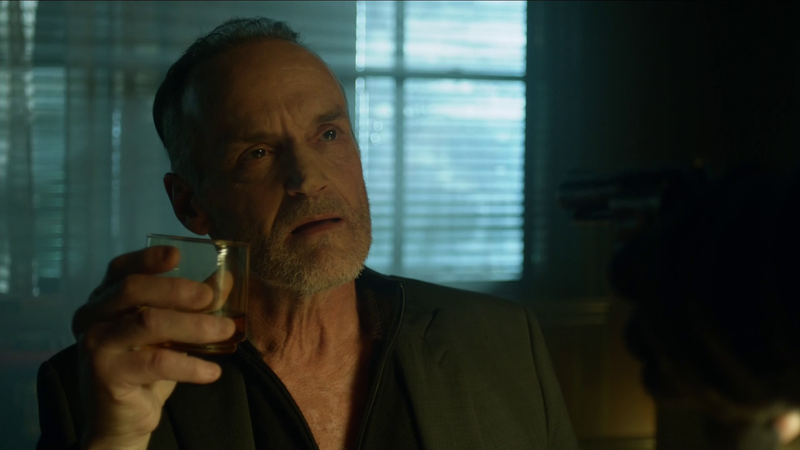 Now, I know that Gotham has its limits – for example not killing the pretty teens in ‘Knock, Knock’ – but still, it doesn’t generally pull its punches completely either, so with the title this episode has, I think you’d expect to see some pretty grim scenes and/or character choices? The new face of the Joker? Matches Malone (Michael Bowen) is this week’s central villain, though it is not his wrath that we’re shown but rather Bruce’s, who needs to face off with Malone about him killing Bruce’s parents. Is Malone then gritty and horrid? Perhaps in such a way that it would make it difficult for Bruce to adopt Batman’s stance of never killing? Well, kind of: he’s a contract killer; he’s killed a lot of people; he’s even killed children (no babies though, got to draw the line somewhere of course). He’s also callous with it: it takes a good description of the Waynes for Malone to remember killing them. But he’s a broken man now, older and questioning life, tired of all the meaningless death, so we don’t see his evil and Bruce’s choice not to kill Malone seems – well, perfectly reasonable. Bruce doesn’t want to be evil, after all. Perhaps it was the speed of the episode’s delivery that bothered me then? The delivery itself has a lot going for it. I liked the parallels Malone and Bruce’s scene used: Malone remembers nothing of the Waynes at first whilst Bruce remembers the night of his parents’ murder in painful detail; and then there’s the line that reminds me of Jack Nicholson’s Joker from the first Tim Burton film – “I made you? Well you made me first!” Malone’s flat too is stylishly shown: dark and lonely, lit by an arrangement of moving, outside lights very reminiscent of the Blade Runner dystopia – fitting I think for a drunk and reflective killer. So again, perfectly reasonable: stylish, dark, with two characters debating the way of things – what’s not to love? I was glad to see Batman’s line against killing being drawn. I was happy that I was wrong with my musing last week about Malone being a patsy for the Wayne killings – it’s a more powerful choice from Bruce if he is facing the real murderer. But it’s all over so fast. Bruce faces off the man he’s been chasing all this time and now it’s just done. It’s just a reason for Bruce to choose the path of the caped crusader – just one more step towards that eventual goal and not some great climax of Bruce’s life so far. You’d be forgiven for thinking then, that it was just a necessary little plot hook to get Bruce onto the streets, to learn the life of the its people with Selina. 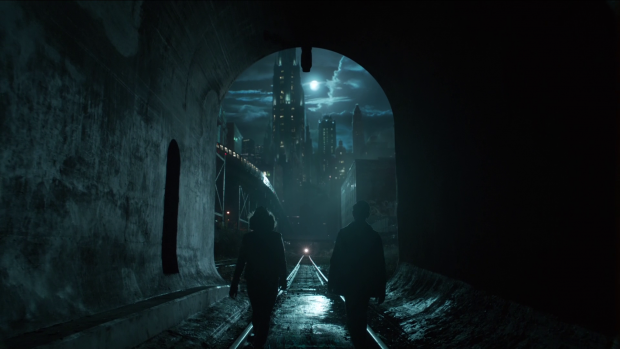 In my mind then, this small development pales significantly against possibly my favourite episode so far – ‘Son of Gotham’ – in which Bruce also moves towards becoming Batman, also in the face of a cruel enemy but played out in a well-developed, longer-built plot: more effort in the build-up, more feeling at the end. Nonetheless, to return to the positive, I still did like the episode. The best part of which was easily the appearance of Lori Petty (I’m positive you do know her) as Jeri, leader of a punk band and paying some serious tribute to Maniax (see ‘Knock, Knock’). Made up in the vein of Jerome Valeska, she is the show’s manifested promise of the Joker becoming an idea in Gotham City. More than that, in just a short space of time she created a powerful, confident presence on screen and I was really taken with her version of the Joker laugh. Again despite her scene being relatively short, I thought her interplay with Bruce more believably a life lesson for soon-to-be Batman than his scene with Malone. All combined, I hope we see a lot more of Jeri, whether she goes on to become a Joker or not. Something else done better with Jeri than another character was the removal of Bruce’s safety net. After Alfred’s fight with Cupcake I really got the impression that Alfred had taken damage because he needed to be gotten out of the way. Alfred needs to protect Bruce but Bruce needs to face Malone alone, therefore Alfred must be taken out of the picture. Again I think this was done much more believably in ‘Son of Gotham’, in which you easily believe an ex-SAS man could conceivably be hurt by a trained ninja. In this episode though, Alfred is downed by a street thug and only gets a cartoon-style drop to the floor in recompense. Surely if Alfred’s as good as we’ve previously seen then Cupcake shouldn’t have touched him? It’s a blow against Alfred for the sake of the plot, so I’m not a fan. Contrast this then with how Jeri gets Gordon out of Bruce’s way. There’s every reason to believe that a club that reveres Maniax would be anti-police and every reason to believe they have a standard response to dealing with police turning up. So Gordon is trapped in the club using a method that doesn’t detract from what we know of his character in any way: he is a police officer and in no way would we expect him to be able to deal with a crowd of people already surrounding him. No compromise of Jim’s character is needed and he’s believably prevented from following Bruce. A last word for Nygma: his paranoia seems to be really taking over now and with it comes the darker, cruel personality. In this episode we only see a little foundation laid for future plot but it begins with a shot of Nygma looking like a devil in the reflected light of his microscope. I’ve not been a fan of the hammer-horror style of the music playing over some episodes of Gotham but a little melodramatic lighting seemed fitting – it wasn’t on camera too long. A perfectly reasonable episode this. Malone’s plot was a necessary hurdle for Bruce and nicely played by Michael Bowen as a man broken by his own life. It was just a shame it didn’t have the same build up that Silver St Cloud’s plot did. I think a scene between a Malone as a long-term villain forcing Bruce to make a choice would have been really powerful. 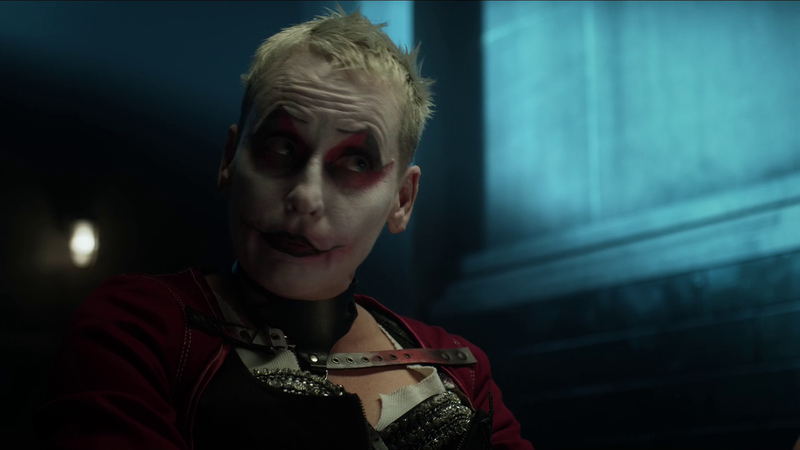 Lori Petty was great and please, please can she be the next Joker figure? Still, she didn’t get enough screen time here to pull up the episode’s batting average beyond just good, as it were. There’s still a lot of good in this episode though and equal promise of things to come. Alfred and Bruce on screen are a fun partnership, just a shame to see Alfred compromised for the sake of the plot. Still, I look forward to seeing more of the Selina-Bruce partnership and the plot moves so quickly I’m sure the Alfred-Bruce one will be back soon. Lori Petty, whose character I really, really, really want to see more of – even better if she can be the next Joker? a nicely played Matches Malone that I would have loved to have seen more of. Malone’s plot being resolved so quickly, losing the build-up that would have made him a powerful part of the backstory of Batman yet-to-be – perhaps Malone’s plot would have been better resolved at the end of a season or half-season? the compromising of Alfred’s character – his fighting ability – by the need to have him hospitalised just to get him out of Bruce’s way; the show did it better in previous episodes and even with Gordon in this one.